A slender but rich meditation on why humans should choose to behave well when the possibilities for doing evil are so abundant. A follow-up to Blackburn’s surprisingly popular Think (1999), this takes a closer look at the thorny subject of ethics, a timely matter in an age of scandal and gossip—even if most of us tend to be forgiving of, say, extramarital assignations and the white lies of daily life. Blackburn suggests that our tolerance befits the modern zeitgeist, a climate in which “we care more about our rights than about our ‘good’,” the logical culmination of the “me decade” and the culture’s insistence on relativism, political correctness, false consciousness, and other enemies of any system of shared ethical behavior. 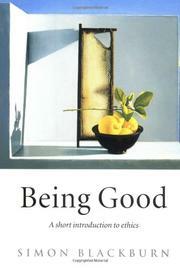 Without falling into tongue-clucking, and careful to distinguish ethics from morals, the author points the way to doing more than merely living “benevolent, admired lives” in benighted times; he urges readers to give close thought to matters of the public and private good and mull over terms such as “freedom” and “responsibility.” Here, he offers us a handy guide to doing just that. His lively narrative examines what he considers to be the principal threats to ethical behavior, key ideas such as “the greatest happiness of the greatest number” and “freedom from the bad,” and the foundations for a modern theory of ethics. Those foundations rest heavily on a much-admired model, the writings of Immanuel Kant, who believed that “necessity of the categorical imperative was easily visible to any reasoning creature.” Blackburn’s glosses lend a down-to-earth, commonsensical quality to Kant’s rarified arguments, which he augments with other theories of right and wrong. Demanding but highly accessible, and highly rewarding.